It is no secret that I am a huge Matt Diaz fan. 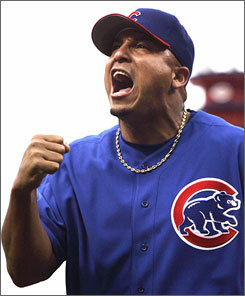 I think he’s the most underrated baseball player in the bigs, and I’m fairly certain he holds the cure to cancer. Since the news came out about Matt leaving Atlanta, it’s been a struggle for me to get out of bed and to be nice to people. I’ve been raving about Matty for the past 3 seasons. Most of Diaz’s time in Atlanta was spent platooning left field because of his “struggles” against righty pitching. Less intelligent baseball fans seem to obsess over Matty’s numbers against right-handed pitching. They would call him a “lefty killer”… which he certainly was. You see, Diaz is a .335 lifetime hitter against lefties, which rightfully deems him as a “lefty killer”, however his .269 lifetime avg against righties is not something to be frowned upon. Alex Gonzalez hits .250 against righties, Dan Uggla hits .267 against righties, and Brian McCann has a lifetime .267 avg against lefties. When I learned recently that Frank Wren picked up Joe Mather from the Cardinals, I wanted to break something. He hit .191 in the majors last year before being sent to the minors where he hacked about .275… sounds like another Chris Woodward or Pete Orr. This move also eludes to the idea that non-tendered possibility Matt Diaz may not be brought back, which terrifies me beyond belief. Word on the grass is that Diaz and Phillies manager Charlie Manuel are next door neighbors and good friends, and the Phils have shown interest in signing my favorite player. If this happens I may sink into a depression that I may not be emotionally prepared to handle. As Bobby Cox enters his final year as the Atlanta Braves manager, I find myself feeling both nostalgic and eager for a new skipper. Us Braves fans have always held Bobby in high regard. I mean, he is the fourth-winningest manager in Major League history, has the most wins of any Braves manager, four Manager of the Year awards, the all-time ejection record, the only person (player or manager) to get ejected from 2 World Series games, and took the Braves to 14 consecutive division titles. However, in light of the past 3 seasons, I am ready for something new.